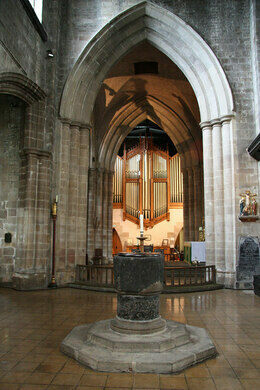 St. Mary and All Saints Church was built in the late 13th century. 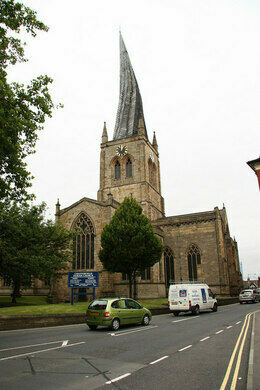 It is the largest church in Derbyshire, built in local stone in a Decorated Gothic style. Altogether it’s a church much like any other in England, unremarkable except for its strangely crooked tower. 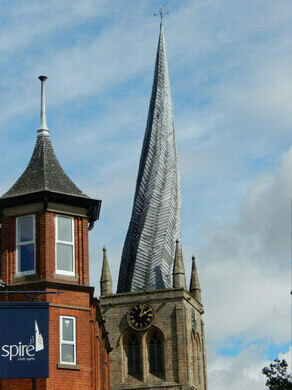 The 228-foot-high spire leans, spectacularly, nine feet from centre and is visibly twisted in a Tim Burton-esque fashion. Half-eaten food on display at an English café. Hidden beneath the streets of London is a secret subway that only carried mail. 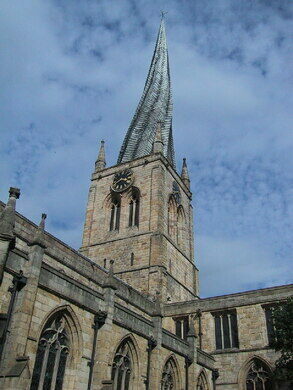 The wooden framed spire was added to the stone tower in the early 1360s. 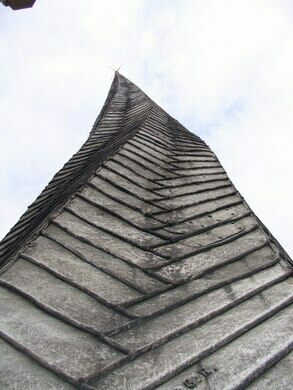 It was initially believed that the twisting was a result of all the skilled craftsmen having died off in the Black Plague, leaving only unskilled laborers to construct the church spire. The theory now is that the distortion was caused by the lead covering added to the wood shingles some years after initial construction. During the day, the south side of the tower heats up in the sun, causing the lead there to expand faster than that on the north side. This imposes a twisting movement due to the pattern in which the 33 tonnes of lead were applied. Also, in the 14th century it was common to use unseasoned timber during construction as seasoned wood was too hard to work with the hand tools available at the time. This would cause the wood to warp with the shingles, further facilitating the twist. As usual, folklore provides much more interesting reasoning for the strange phenomenon. Several local legends hold the Devil responsible. In one tale, a blacksmith was fitting a horseshoe to the Devil’s hoof and knocked a nail into the soft part of his foot. 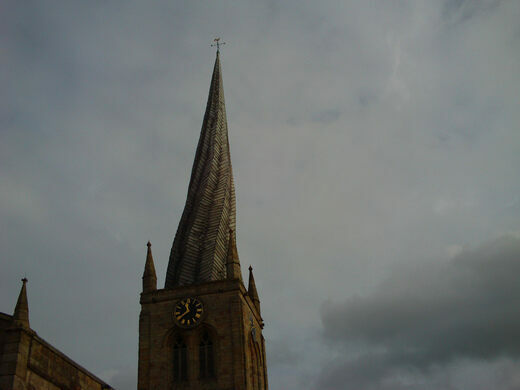 The Devil then jumped over the town in pain, knocking the spire out of shape as he passed. Another story has the Devil sitting on the spire and wrapping his tail around it. The people of the town rang the church bells and the Devil, frightened by the noise, tried to escape with his tail still wound round the spire, causing it to twist. 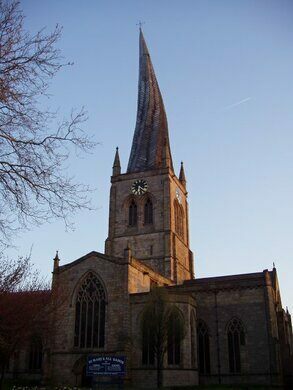 Another, somewhat cheeky story is that that a virgin from Chesterfield once married in the church and the building was so surprised that the spire turned around to look at the bride. 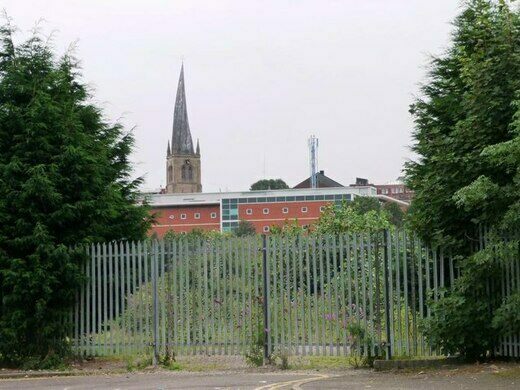 The legend is that that if another virgin from Chesterfield marries in the church, the spire will straighten up again (in some versions it is specifically a virgin from a particular part of the town or even from the nearby city of Sheffield, depending on who the teller wants to wind up). There are daily guided tours up the tower ( £5 currently) but it is recommended that potential visitors check the church website for up-to-date times, prices etc. If you are travelling by train between Sheffield and London or vice versa you will get a really excellent view but it really is worth breaking the journey for a proper look. If travelling by car on the M1 motorway junction 29 is best whether travelling north or south. 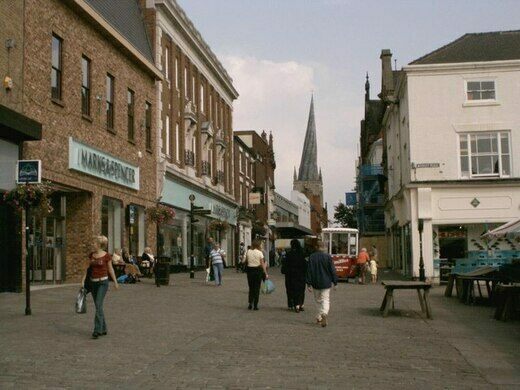 Street parking is difficult so try the St Mary’s Gate car park.Whilst in Chesterfield check out the Tudor-built Royal Oak pub in The Shambles (the oldest in the town) , said to be built on the site where the Knights Templars rested on their way to the crusades (a Knights Templar residence was just south of the town). to Scotland, Southern England, Ukraine & Bessarabia, and more. This enormous spiral sculpture looks strangely out of place on the edge of a housing development. The former home of a railway legend and the site of a gigantic labyrinth. A secret meeting in this small cottage changed the course of British history. When methane gas started seeping up from the ground, they picked up and moved the entire town. A remarkable medieval structure born from a 14th-century disaster.